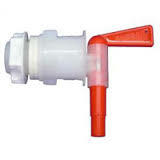 Fast Flow Spigot. Uses 1/2'' tubing for faster flow. Also great for Kombucha. For use with bottling bucket. Fits 3/8'' racking tubing. Also great for Kombucha. For use with bottling bucket. (can be rotated 360 degrees for easy storage.) Fits 3/8'' racking tubing. Also great for Kombucha. Replacement seal for bottling spigots. Excellent valve design. With two gaskets.